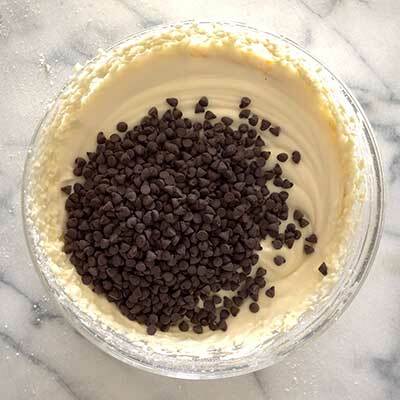 An easy cannoli dip (that doesn't taste like cream cheese!) mixed with delicious mini chocolate chips and served with broken waffle cones for dipping. For as much as I claim to love desserts dips I’ve seriously been neglecting them as of late. I had to check my recipe archives to be sure, but my last dessert dip was posted all the way back at the beginning of March. So, clearly, this easy cannoli dip was more than called for. And if you’re like me and haven’t fully come to terms with the fact that we’re almost half way through the month of May (!!) that means it’s been two whole months since I whipped up something sweet and dippable. Time, you need to slow your roll. Wait, are the cool kids still saying “slow your roll”? Guess I’ll just have to cross my fingers and hope for the best, cause I’m just not ready to upgrade my slang and use “on fleek” in a sentence. I have to admit that the recent lack of dessert dips is all due to the “parfait craze” I’ve been on lately. Once the Baileys Cookies and Cream Parfait post took off, it was hard not to make even more parfaits. I gotta give the masses what they want, right? But, sadly, none of my other parfaits did anywhere near as good as the Baileys one, so aside from one more awesome parfait I have planned (seriously, it’s a doozy!) I’ll probably cool it with the parfaits for a while and go back to my tried and true dip recipes. Although, at the end of the day, I’m game for any type of no bake dessert. I’m not the best baker (though I do try!) so anytime I don’t have to depend on whatever voodoo magic my oven casts on baked goods is fine by me. Parfaits and dips are just the easiest route to all the sweet food I crave. Now, the cool part about this dip is that it surprised me. I wanted to make a dip with the ingredients I had on hand, and it just so happens I always seem to have a lot of cream cheese in my fridge. But for this cannoli dip, that wasn’t the case, because you can’t taste the cream cheese in this. Like, at all. And I would never have believed that if I had not made it myself and learned the truth. 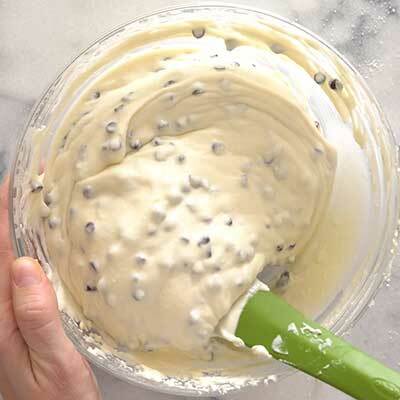 So there you have it: a five-ingredient dip that’s easy to throw together and still has all the indulgent flavor of a true cannoli. I can’t wait to make this at our next party! Do you have to use Cream Cheese? Since I posted this recipe, many readers have said they wished it didn’t include cream cheese. And I totally understand that – cream cheese can be very overpowering and it’s not a flavor you normally think of with cannoli. However, in this case, I promise that you can’t taste the cream cheese in this recipe. The only reason why cream cheese is used is to give the app a little thickness and consistency. Do you have to use Ricotta Cheese? Most traditional cannoli recipes are made with ricotta cheese. You might find some variations, but from what I’ve read, ricotta cheese tends to be a cannoli staple. So if you love cannolis but are unsure about ricotta, invite a few friends over and give this dip a try as it’s written. I promise the taste will be very similar to the cannoli you already love. And if not? Your friends can help you eat what’s left. I’ve made this dip a few times without any issues, but some readers have said that their dip came out watery or grainy. Thankfully, there are a few easy things you can do to help prevent this from happening to your dip. I would highly recommend splurging on a high-quality brand ricotta made with whole milk. I like to use Shamrock brand. 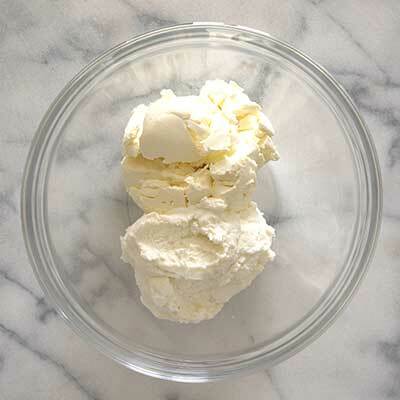 Make sure the ricotta is very fresh and ideally from a container that’s just been opened. This will help lessen the chance of excess liquid in the ricotta. If you do notice that your ricotta has extra liquid or isn’t a firm, you can use cheesecloth to help drain any excess liquid from the ricotta. 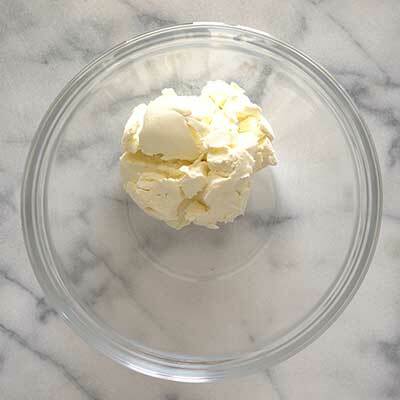 If you’re unsure how to do this, check out this tutorial on how to strain ricotta cheese. Using any one (or all!) of these tips will help ensure your dip has a nice creamy consistency. If making the dip in advance, refrigerate in a covered container overnight, then allow the dip to soften on your counter until it has a firmness you’d like for dipping. 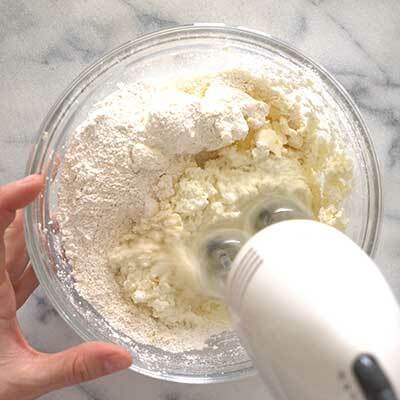 Step 1 – Using a stand mixer (or hand mixer + large bowl), add ricotta, cream cheese, and powdered sugar. 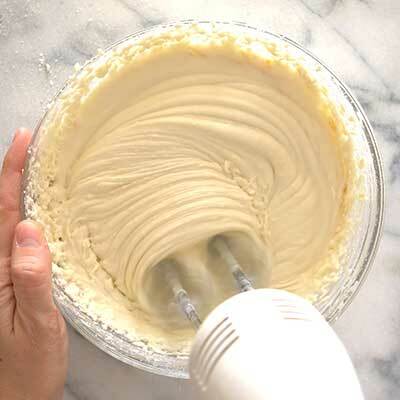 Whip them together on medium-high speed until ultra creamy. Step 2 – Toss in the vanilla extract and mix until absorbed, about another 30 seconds or so. 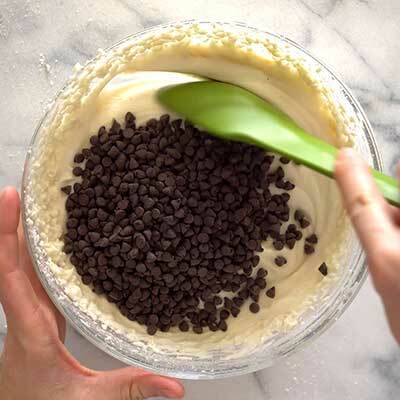 Step 3 – Add chocolate chips and gently fold them into the cannoli mixture. Step 4 – Serve dip and enjoy! 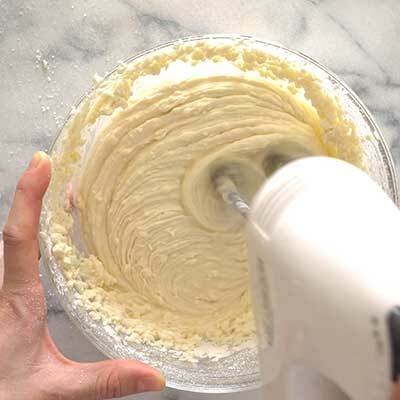 Using a stand mixer (or a hand mixer + large bowl), add in ricotta, cream cheese, and powdered sugar on medium-high speed until smooth, about 3-5 minutes. 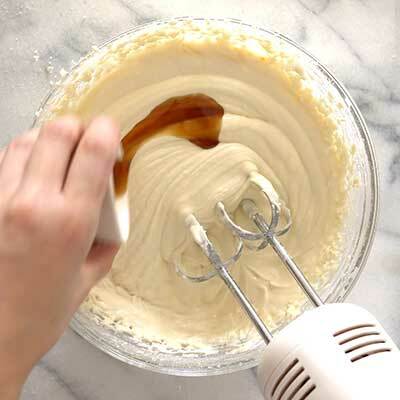 Add in vanilla extract and whip for another 30 seconds. Taste test the dip - if you'd like it sweeter, add more powdered sugar, about 2 tablespoons at a time. 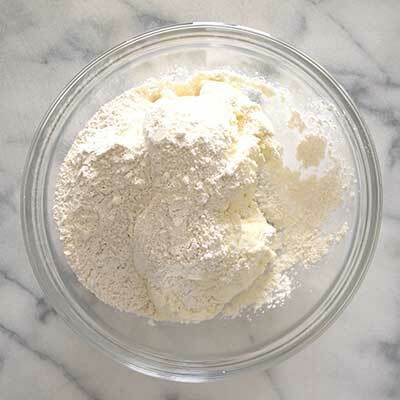 You can safely add up to another 1/2 cup of powdered sugar (8 tablespoons) without negatively impacting consistency. Fold in mini chocolate chips, reserving some to sprinkle on top for decoration if desired. Serve dip immediately with broken waffle cones for dipping. I made this today. It is delicious. I didn’t have mini chocolate chips so I substituted chocolate and peanut butter chips. Still yummy! I used this as a filling between layers and on the top of a dense chocolate cake; then iced the sides of the cake with a fudgy chocolate icing. A year later, all the guests for a New Year’s Eve party are asking me to make it again! After cooking all day, I made this recipe last and totally spaced it with the semi sweet morsals. I had both regular size, and mini morsels on my counter and used the larger by accident. Do you think it chang s texture or consistency, or quantity needed for recipe? It doesn’t look as good as yours but I decorated with chips and marachino cherries with a tad sprinkle of cinnamon. How far ahead of serving can I make this. Can this be frozen and used later? I made a batch and it was delicious but I have leftovers that I’d like to save. substitute mascarpone for cream cheese and you’ll eliminate the tang. Garnish with chopped pistachios. Friends and family absolutely love this recipe! One question…you list the nutritional info, but what is the serving size that you calculated this for? Besides broken up waffle cones, I serve this with strawberries also. Always a hit!